CJE SeniorLife‘s Lieberman Center staff has utilized funds from an AFA bi-annual grant to expand the scope of its Purposeful Engagement Program (PEP), which serves more than 80 people living with Alzheimer’s disease or related dementias. Specifically, CJE created thematic sensory stations in sitting areas to engage residents with late-stage dementia through tactile items, photographs and different aromas. 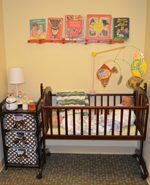 One station includes life-like baby dolls, a cradle with a mobile, a dresser with vintage baby clothes and blankets, bilingual children’s books, scented lotion and baby powder air freshener, and speakers that play lullabies. In weekly nurturance groups led by social workers, residents care for the babies by reading them stories, feeding them, singing to them, and rocking them to sleep. CJE also used the $5,000 grant to educate staff and family members on sensory-based approaches to care.